I own a lot of stripes, I enjoy wearing berets, and I have a hard time turning down wine and cheese. I don’t consider myself a Francophile, but I certainly have an appreciation for aspects of French culture. And perhaps a bit of jealousy for the way the French seem to have such an easy time of working so much pleasure into their meals. That being said, considering the percentage of obese French citizens is far, far lower than that of Americans (16.9 percent vs. 33.9 percent, according to the World Health Organization via The Parisian Diet), clearly they’re not stuffing their faces with cheese and croissant in between sips of Bordeaux and the occasional puff on a cigarette. 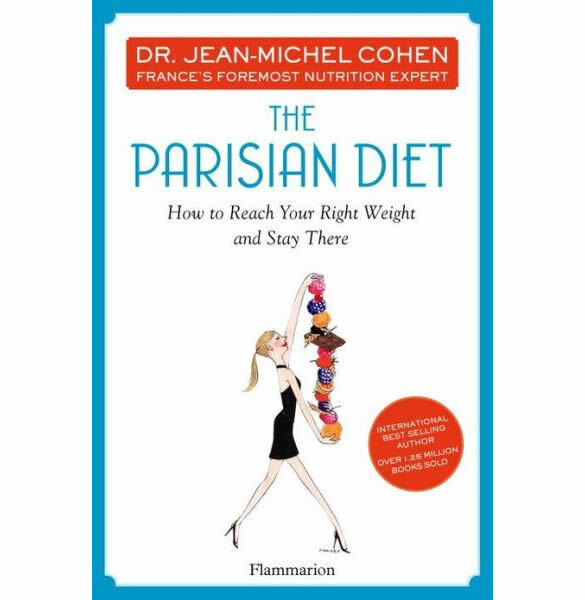 The Parisian Diet, by Dr. Jean-Michel Cohen, aims to demystify the French lifestyle — specifically, demystify it for Americans. Dr. Cohen is well-known in France as a nutrition specialist, hosting weight-loss reality shows and appearing on the French edition of Top Chef in addition to creating the first interdepartmental consultation center on obesity in France. He takes a stand against fad diets and promotes eating real, whole food. So, naturally, I was pretty psyched to see just what his magic consisted of. For the entire introduction, I just kept nodding my head. His approach sounded an awful lot like what we preach here on FBG: set aside time to eat — and enjoy it! Make it more of a ritual and savor every aspect of it, from prep and presentation to that final swallow. Don’t focus on the challenges or any failures, but instead, treat yourself with love and kindness and view the decision to live a healthier lifestyle as a positive thing you get to do rather than a chore. Dr. Cohen makes some interesting observations about the French way of eating vs. the American way. Mainly, the French tend to eat three true meals throughout the day with little to no snacking. Lunch is often a very leisurely, social occasion lasting an hour or two, and dinner is spent with family, and also takes a considerable amount of time. He also mentions how the vast sharing of cultural eating habits have influenced noshing opportunities around the world, but especially in America. In some cultures, it’s normal to have a huge breakfast and eat light meals throughout the day. Others always have a substantial meal at night. And then there’s brunch and big lunches … and basically, many of us have access to all those things, all the time. Because they’re the norm in other cultures, it can be easy to justify eating a large breakfast, a heavy lunch, then topping it off with a leisurely (and calorie-heavy) dinner. Followed by dessert, of course. It seems more and more normal. He also gets into some of the reasons people gain and find themselves unable to lose weight, and uses case studies as examples. Maybe I’m just a psychology geek of sorts, but I found that pretty fascinating. We’re all fighting our own battles, and it’s interesting to see how often those battles can show up as extra weight. And, his way of determining your Right Weight (i.e. what you should consider for your goal on this diet) is really interesting, taking into account your weight at 18 years old, your heaviest weight, your lightest adult weight and your current weight. If that number is higher than what you’d like to get down to, that’s okay — simply use the number you come up with as a goal this first time, and then, as you lose weight, you can start over from the beginning of the diet, and your new, lower current weight will automatically bring your Right Weight down. That’s kind of a cool way to look at reaching a target weight. 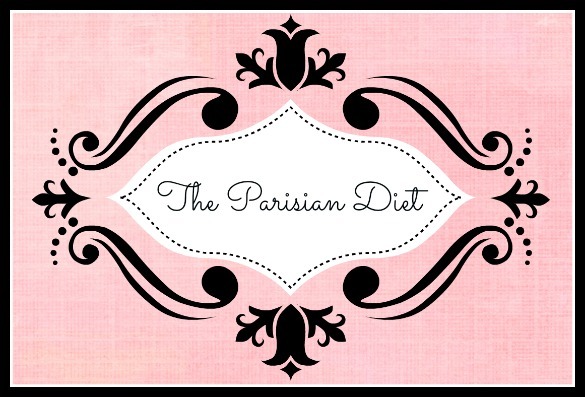 So the premise of The Parisian Diet and the way it’s meant to help you create a healthy lifestyle, I can get down with. I’m not sure I would ever be a strict three-times-a-day eater, but I can appreciate the concept of taking the time to truly appreciate what you’re eating. That being said, I had a couple of problems with the actual diet portion. The first and biggest, in my mind, is the fact that, although Cohen routinely pushes the importance of real vs. processed foods, he also pushes diet sodas, artificial sweeteners and low- or nonfat dairy. That seems a bit contradictory, no? Surely, there must be better ways to cut calories. Bistro, which is also quite restrictive, is to be used for a maximum of three weeks. I didn’t get hungry just looking at it, but I admit it would be a challenge for a full three weeks. We aren’t talking about a ton of calories, here. Gourmet is the final part of the plan, designed to help you continue to lose weight while eating a little more normally. This part of the plan can be followed, as strictly or loosely as you want, indefinitely. I dig that there are a lot of recipes, meal plans, suggestions for meat and ingredient substitutions, and tips for making the most of your food in here, plus some great words of wisdom about how to approach eating and weight loss. I mean, how can I fully disagree with a book that urges you to treat yo’self? But I’d suggest talking with your doctor before trying this diet (especially if you exercise like a boss) because, well, you start out with seriously few calories, and that’s not entirely FBG-ified. I’ve never heard of the Parisian diet. Thanks for the introduction! It’s quite shocking to read that the parisian diet pushes the use of diet sodas and artificial sweeteners, it’s not healthy! The French seem to have discovered a new way to sell things to Americans! Seriously, it’s true that the French have less of an weight problem than we do–however, they are gaining kilos, too, overall, and have been for years. Magazines are full of articles bemoaning this new deplorable aspect of “americanization.” There is more eating at places like McDonald’s. The portion sizes in all restaurants are noticeably bigger than they were, say, 20 years ago (this makes me sad). There are clothing lines and dress shops especially for woman who are more “round.” And, yes, Parisians tend to be thin but I suspect it’s for the same reason New Yorkers tend to be thin. They walk more. Go out to the French countryside and you will see plenty of overweight French people! It leads me to wonder if in a few years they will be facing the same issues we face, at the same level. And I’ve always thought it funny how the French insist they “avoid snacking” but if you sit yourself down at the window table of any cafe in Paris at around 5 p.m. you will see scores of people hurrying down the street munching on a croissant or pain au chocolat. They can’t all be tourists, can they? All that being said, it is still true that the French are thinner and it’s probably because they are much more disciplined about eating than we are. I have witnessed charming scenes of French mothers instructing their tiny toddlers on the merits of camembert versus bleu cheese. Teaching them, really, to think about tastes and what they’re eating from an early age. Even very small children are expected to sit through two-hour-plus meals without fidgeting or interrupting. Mealtime is more sacred there. There are clear rules of what you can and cannot do. And maybe this attitude of true appreciation and respect for food contributes to a healthier outcome. Also, I would say that in general food is more “real” in France. Simple things (eggs, bread, cheese) simply taste better, and are thus more satisfying. Sometimes I think the reason we Americans eat more is that our food is just not satisfying us.